It's cheap. I don't care. It's good. And I'm drunk. I shot trap tonight, and I just shot my best score ever. And, it was against the best team in the league, and it gave us the win. 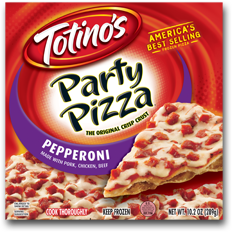 So, I'm eating a Totinos, I'm loving it, and I don't care what you think about it.